Lake Naivasha is a beautiful freshwater lake, fringed by thick papyrus. These forests abound with bird life, and Naivasha is known as a world class birding destination. The waters of the lake draw a great range of game to these shores. 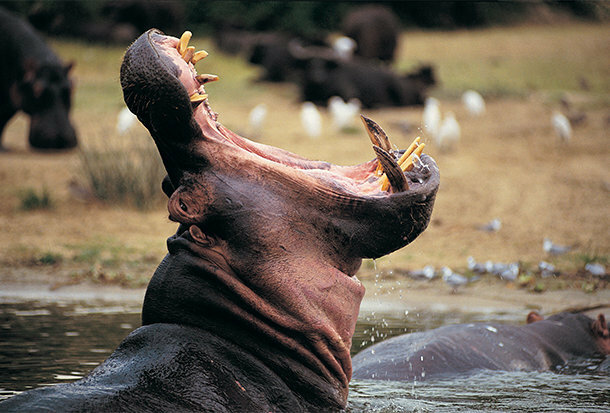 Giraffes wander among the acacia, Buffalo wallow in the swamps and Colobus monkeys call from the treetops while the Lakes large hippo population sleep the day out in the shallows. You can ride among giraffes and zebras, sip on a glass of Rift Valley red, look for hippos on the lake. You'll be picked up from your hotel, and taken a 90km drive from the city to Hell's Gate National Park. Located between beautiful Lake Naivasha and the twin Longonot and Suswa Volcanoes, Hell's Gate is one of Africa's most visually stunning parks. Hell's Gate is famous for its natural hot geysers, its eagle and vulture breeding grounds, and the variety of activities that visitors have access to during their visit. Hiking, cycling, and rock climbing are just a few of the options available to visitors. While Hell's Gate is known primarily for its landscape, there is still game to be spotted within the park. Buffalo, giraffes, elands, lions, leopards, and cheetahs can all be spotted in the park on occasion. Later we proceed for lunch at Lake Naivasha Sopa Resort. Set in one hundred and fifty acres of grassland studded with Acacia bushes and trees, the resort is not only home to our resident giraffe, waterbuck and both Vervet and Colobus monkeys, but it is also a night stop for the hippos when they leave the lake every night to come and trim the grass on our expansive lawns. There is just one “Crescent Island Game Park”. Located on Lake Naivasha, Kenya in the Great Rift Valley. It is one of the most beautiful parks in Kenya, and is Naivasha’s best kept secret. Surrounded by water, it is actually a peninsular and is accessible by boat from East or West as well as by road. The shores host abundant birdlife including pelicans, cormorants and fish-eagles with their haunting cry. There are more animals per acre than any other Kenyan Park. On arrival you start with a boat ride tour with a one hour speed boat animal viewing expeditions. The boat drops you at the island where you are welcomed by guides and proceed for a walking tour. Come close to friendly wild animals with well trained guides leading you. After this guided tour, the boat will come for you for the dry land and departure for Nairobi. Drop at your Nairobi hotel with a lot of memories.